The PSC PowerScan 7000 has been renamed to the Datalogic PowerScan 7000. 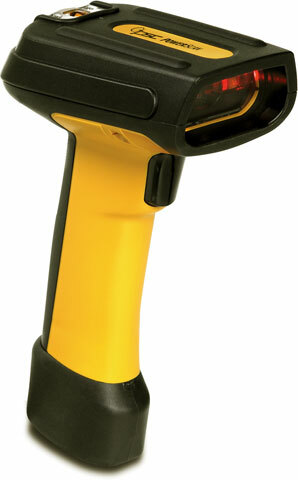 PowerScan 7000 SRI, Standard Range Imager, Multi Interface, RS-232 Default Configuration No Pointer, Color: Yellow/Black. Scanner Only - Cables and accessories must be purchased separately. These include USB (Part# CAB-465), PS/2 (Part# CAB-436), or RS-232 Serial cables (Part# CAB-456), AC Line Cord (Part# 8-0935), and a Power supply (Part# 6003-0941). Solid state design makes the PowerScan 7000 the most rugged and reliable scanner on the market. The PowerScan 7000 Standard Range Linear Imaging Scanner (SRI) has been designed from the ground up to be the most rugged, durable and reliable industrial handheld scanner on the market. It is perfect for package handling and tracking, warehouse applications, shipping and receiving, manufacturing shop floor and other demanding applications. The overmold covers all of the likely drop contact points, adding an extra degree of shock protection for the scanner. In fact the scanner can withstand 50 drops of two meters (6.5') to concrete. The scanner is sealed to dust and water at an industry leading IP65 rating. It can operate between -30° C and 50° C. These specifications are not surpassed by any competitive scanner. The innovative and unique PSC optical design allows the scanner to feature a depth of field that is unsurpassed by any other standard range scanner, whether imager or laser. An optional integrated laser aiming beam is also available for applications that need more precise or brighter aiming cues. The high-speed digital hardware and advanced PSC decoding algorithms allow read rates up to 500 scans per second, making the PowerScan 7000 SRI the fastest industrial scanner available. The scanner features a multiple interface architecture that allows connection to the majority of the host terminals on the market; including RS-232, USB, Keyboard Wedge, Wand Emulation and IBM POS interfaces. The scanner works with most of the same cables as the family of PowerScan laser and 2D imaging scanners. Minimum distance determined by symbol length and scan angle. Printing resolution, contrast, ambient light, temperature, and scan angle dependant. Wyse 55, 60, 120, 150, etc. ; IBM 347X/3487/31XX; Digital VT220, 240, 320, 420, 510, 520; Sun 420, ITX, and Sparc 5/10.